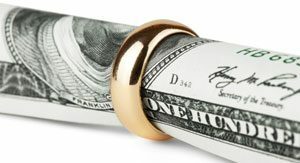 One of the bad surprises that we see in the divorce process is the amount of money that is owed by both parties as individuals, and as a couple. This can be gnarly and painful and needs professional help to ensure accuracy. A person’s responsibility for any debt the couple has incurred during their marriage can only be properly addressed when you know how much you owe and to whom. At PeaceTalks we suggest you order your credit report from each of the three credit reporting agencies: Equifax, Experian and TransUnion. Your credit report will reveal what is owed including joint accounts with your spouse. Once you identify which debts are shared and which are in your nameonly, you need to prevent them from growing any larger while you’re getting divorced. It’s best to cancel shared accounts leaving one card in your name in case of emergencies. Now it’s time to decide who will be responsible for what debt. Here are a couple of examples of strategies that PeaceTalks suggests for dealing with debt in a divorce. If you have assets you can sell, pay off the debts now. You won’t have to worry about his/her portion of the debt, and you can start again, debt-free. One can also exchange an equitable amount of debt for assets from the division of your property. This is another example of where mediation can be a much faster and less expensive process for reaching a satisfactory agreement. If you think you might have overlooked something in preparing for your divorce please contact the office with your question.